"I have pledged myself to your service, as so many of you are pledged to mine. Throughout all my life and with all my heart I shall strive to be worthy of your trust"
Released to mark the 90th birthday of Her Majesty Queen Elizabeth II, this complete publication recounts the life and reign of the Princess who was never meant to rule yet became Britain’s oldest and longest reigning monarch. 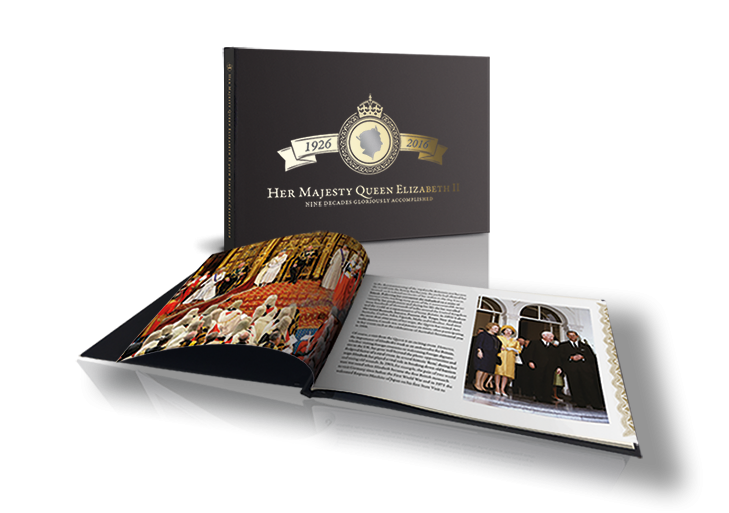 Including a foreword by Raphael Maklouf FRBS FRSA NDD, the British and Commonwealth coin designer whose official portrait appears on H.M. Queen Elizabeth II's 90th birthday coin, this new 60-page hardback book spans nine decades of the Queen's reign. Featuring original photography and illustrations of the Queen and Royal Family, the book captures the more personal moments of the Queens life: from her marriage to Prince Philip in 1947 to the birth of their children, grandchildren and great-grandchildren, including the arrival of our future King, Prince George, in 2010.